This professional style comes in an exceptional array of colors with the Core 365 88181 Origin Men's Performance Pique Polo Shirt. 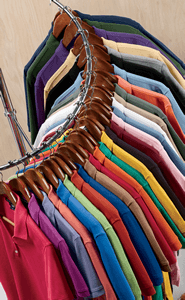 For gentlemen who enjoy the practical application of a moisture-wicking, antimicrobial, UV-protected shirt but desire to go beyond the lineup of classic colors, this polo comes in a variety of vibrant shades for you to choose from. Made from durable 100% polyester, this pique polo shirt is sewn to last. The flat knit collar has the same built-in protection from curling as a welt collar, but lays flat against the neckline for a slightly more casual look, along with a placket of three color-matched buttons. A heat seal label allows you to keep fitment and care information handy without a scratchy tag. The 4.1 oz. fabric weight is dense enough to let you feel the quality of the shirt without compromising that airy, flexible feel you get from feather-weight fabrics.